Adding text to video as a watermark or using captions, text, intro or credit will help you easily tell your story with video. You can add text to videos with some online tools, but there will always be size and feature limitations. 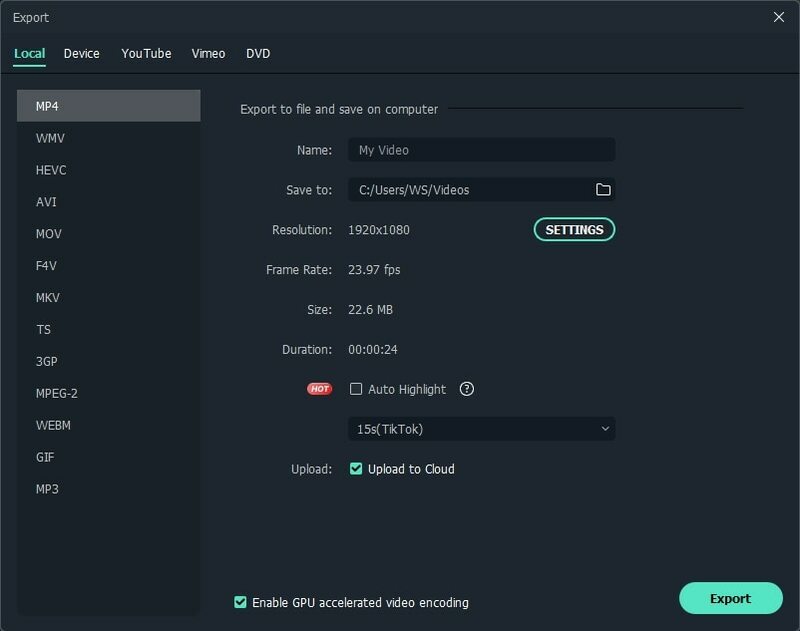 While, in this article, I recommend you to add text, end rolling credits, video intro openers and lower 3rd subtitles with Wondershare Filmora9, because you can use it no matter you are using a Windows or a Mac computer. 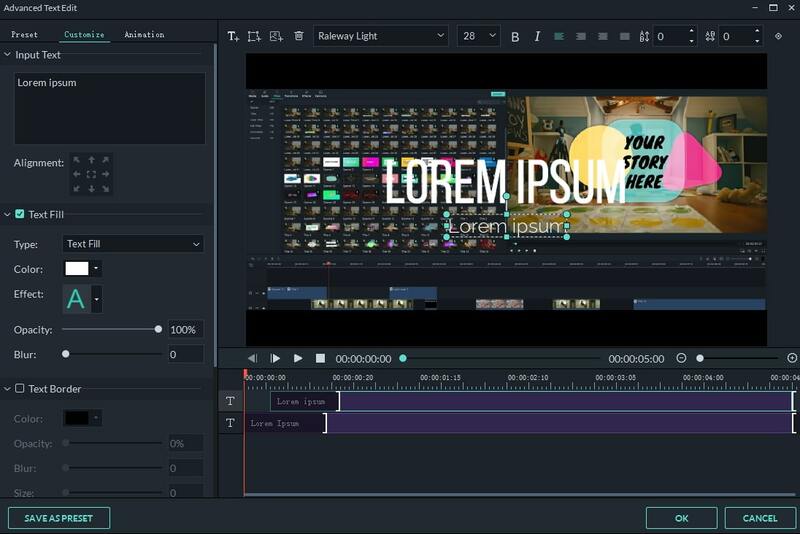 Filmora9 comes with powerful yet easy-to-use text editing tools to help you add titles to video easily. 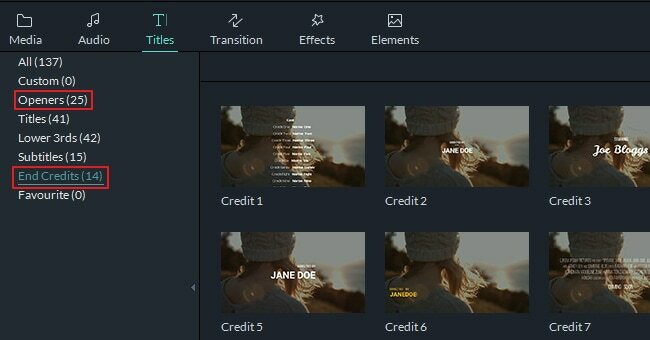 This article will show you how to add titles and intros/credits to a video using Wondershare Filmora9. You can add text to video easily with Filmora9. After adding, you can also change text font, size, color and so on. Filmora9 has more than 100 text presets in it. With Filmora9, you video will look more attractive. Before we get started, download it from below first. Before adding a video to the Timeline, you need to import videos to the media library. This way, all your editing won't apply to the original videos which keeps them safe. To add text and titles to videos, drag and drop a video from the media library to Timeline first. Click Titles at the top, which you will see more than 100 text templates on the left panel. The text and title presets cover Opener, End Credits, sub tittles, lower 3rd, and some special title effects for special event as well. Double click the text preset effect in the library and check its effect in the Preview window. Drag and drop the target text template to the Timeline, and you will see a text thumbnail with a leading letter "T". Double click the text thumbnail will open the text editor panel, where you can type in your text, and then select the font, color, animation, etc. Preset styles are also included. In the Text Basic settings, you can change the font, color, alignment and size of the text and titles, or select one of the text style from the built-in text style library as well as the apply the animation to the text and titles. You can also save the settings as a preset and use the text effect in the future with ease. Filmora9 also provides an Advanced text editing panel. In which you can customize the text and title effects further. You can add more text boxes even different shapes to the video and customize the text fill, border and shadow. You can also alter the duration of each text element to change the playback speed of the text effect. Note: When you drag and drop a text template to an existing one, the original will be automatically split and the new one will insert to the current position. By the way, after you drag and drop the text template to the timeline, you can review the whole text effect in the preview window. On the Timeline, you can move the added title to any position and let it display at specified time. Also drag the edge of text thumbnail to change the duration of the text effect. To delete a video title, select it and click the Delete button above Timeline or simply press Delete key on the keyboard, or right click to choose Delete. Intro/Credit is more like a combination of titles and photo. Actually, you can add it anywhere on Video Track of Timeline. They help you create chapters and good-looking intro, credit and cast. 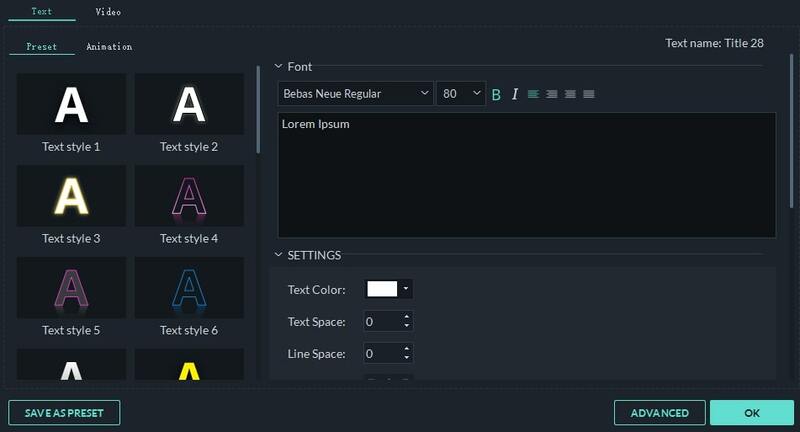 Currently, Filmora9 provides more than 20+ opener and intro and 14 End Credits text templates. Similar to adding titles, you can simply drag and drop a template in Intro/Credit tab to Video Track on Timeline. If you drop it on an existing video/photo, the original video/photo will be split and the Intro/Credit will insert at the specified position. Now double click the text or photo to editing Intro/Credit. For the Intro/Credit titles, you can change text, font, color, animation, etc. For the photo, the built-in editing tools including Rotate, Crop, Brightness, Contrast, Saturation, Hue, and Motion. On the Timeline, move text/photo and extend their duration as described above. After finishing adding text to video, click EXPORT and you get five ways to output your video: Local, Device, YouTube, Vimeo and DVD. For device and format, all popular devices and formats are supported (If you can't find the suitable device, you can try to save with suitable formats which can support your device). Besides, it's convenient to directly upload a video with text to YouTube, or burn to DVD without third-party DVD burning tools required. It's so easy to add titles and credit to your video. 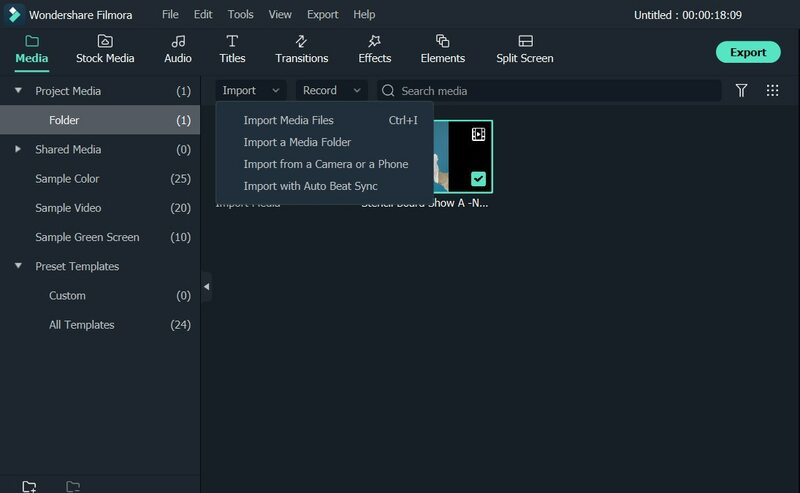 No matter you want to add some subtitles, 3rd titles, openers or end credits to the video, you can achieve it in Filmora9 easily by dragging and dropping. For the detailed steps of adding texts to video, you can check our guide about Text and Titles. Why not download Wondershare Filmora9 to have a try now! I'm having the same issue. Just downloaded the free version. Any ideas? Where can I get more text effects apart from the built in effects which I can use for the corporate videos? I am trying to create and intro and credits. I can see my textbox on the video timeline and I have entered the text I want, but when I play the video the text does not appear. Any suggestions? Hi! I already put a text in the beginning of my video which I extended the time length and I am trying to do the same at the end and I can't extend the time more then 5 sec? I extended the first one to 15sec. Can anyone tell me if you can fade Title-1, (as that's the one i'm working with at the moment)? I can get the text to disappear but not the little side bar as that was the actual part of Title-1. Martin, go to MEDIA, then SAMPLE COLORS (left side). Hi guys, since the last upgrade to ver. 8.5, its impossible to change fonts, it all looks like the default font. Is this a familiar bug?